Your shopper has smoothly navigated the first few steps of the purchase funnel. They have moved through awareness, interest, and consideration and into the intent to purchase. Their items are in the cart, but something happens, and they abandon the journey at its crux. As an online retailer, this is probably your worst nightmare. Digital marketers have spent years trying to make e-commerce checkout processes as seamless as possible. As a result, they’ve come up with one general guideline that encompasses multiple solutions: the checkout process should be as brief, simple, and distraction-free as possible. Shoppers should not encounter any friction in the checkout process. Even the smallest inconvenience could cause them to give up and find the product elsewhere. 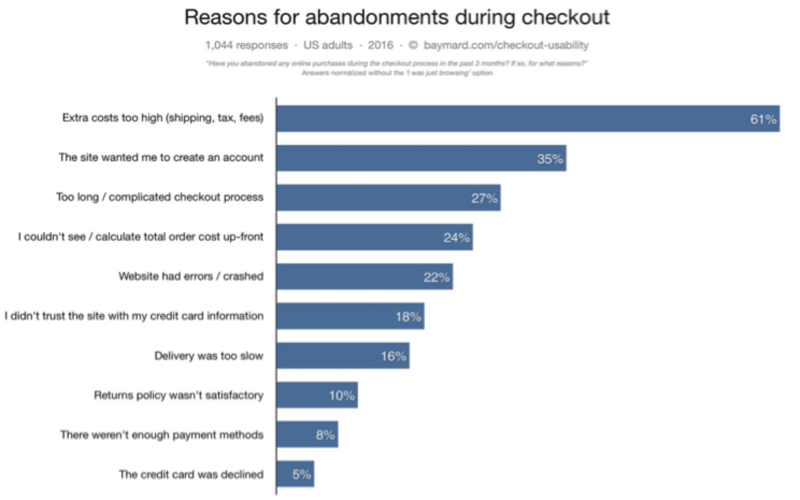 There are a few key considerations to keep in mind when working to optimize your e-commerce platform’s checkout process for decreased abandonment. This cannot be stressed enough: do not force your shoppers to create an account in order to check out. Offer it as an option, but always make guest checkout readily available. In a 2016 survey, 23% of individuals that abandoned their shopping carts did so because they had to create an account. That’s nearly a quarter of all lost sales. Many e-commerce companies use account creation to capture emails, but this can still be done separately. Ask them to enter their email in the guest checkout, and provide them with the option to opt-in for special offers. What really irritates shoppers most is creating and remembering a password. Another alternative is to allow social sign-in. As most people are already signed into their social accounts, and this method doesn’t require password creation, this is a much easier way to go about it. With Google’s recent rollout of mobile-first indexing, in which Google favors the mobile version of websites for their index, having a mobile-friendly site is crucial. To further solidify this, current reports show that 19% of all US e-commerce sales take place on a mobile device. This figure is estimated to reach 27% by the end of this year. These numbers will only continue to increase. Therefore, testing your checkout process for mobile-friendliness is a must. To begin, access the Google Search Console’s mobile-friendly test, and plug in your site URL to see how it performs. Manually test your checkout’s mobile usability, also. Access it via your mobile device and keep an eye out for fields that are cut off, dropdowns that don’t work, or buttons that are difficult to select. The mobile checkout process should also closely resemble the desktop checkout process, so as not to confuse shoppers that may access their cart through both devices. It can be tempting to try and get all the info you possibly can out of customers. A checkout process with an extraneous amount of fields is a major turn-off. While there are certain high-value questions you can include, know where to draw the line. For example, including a field for date of birth in order to offer your customers gifts and incentives for their birthday is a high-value ask. Make sure to make the reasoning for asking this known. Other kinds of fields, such as “How did you hear about us?” and “Would you like to refer a friend?” should be avoided if possible. Just seeing these fields in a checkout can make customers groan and turn away. Evaluate the potential payoffs of the additional fields you wish to include in your checkout form. If it provides an opportunity to upsell or increases the likelihood of customer retention, go for it. But, if it’s solely self-serving, forego it. Questions that provide advertising metrics fall under the latter. Run trackable campaigns to obtain this information instead. It happens to most of us. We fill out a form, hit submit, and receive an error message that something was filled out incorrectly. Maybe the field is highlighted in red, but that’s the extent of information the error message has provided you. You try re-entering the information every way you know how, unable to determine exactly what the error is. Error messages should be specific, detailing exactly what is wrong with an entry, whether hyphens need to be inserted in a phone number, or a credit card expiration year needs to be four digits instead of two. In addition to this, error messages should be appropriately placed where users can clearly see them after submitting the form. If a user hits submit at the bottom and the submission fails, but the error message is all the way at the top, it could take a user minutes before they scroll up and notice this. Error messages should be placed on/around the fields in question, as well as within the user’s immediate eyesight. Otherwise, they’ll give up and go back to Amazon. The ultimate lesson to be learned here is that your checkout process should be as uncomplicated as possible. This might require some A/B testing, as what works for some retailers may not necessarily work for others. For example, in light of making checkout simple, numerous retailers are experimenting with a single-page checkout. In theory, a single-page checkout compounded by the aforementioned suggestions should boost your conversions. Behavioral studies show that the fewer clicks it takes to complete an action, the higher the conversion rate. To maximize the convenience of your checkout process, you may also want to implement Google Autofill. This feature will fill out a shopper’s information for them, allowing them to breeze right through the checkout process. Once your customers know what they want, they want to get it as quickly as possible. They’ve spent enough time trying to research and locate the product in question, which means they’ll be all the more grateful for an easy checkout process – and all the more likely to return.